Methadone withdrawal is not as bad as heroin or morphine, but it does last longer. Understanding the withdrawal symptoms you may experience will help you get through the roughest part of the process. 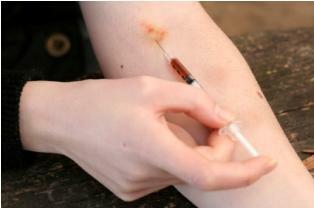 Methadone withdrawal happens when you reduce or stop taking a methadone dosage. When you take this drug, your body becomes dependent on it and needs time to return to a state in which methadone is not present. During this process, your body goes through many changes that cause you to exerience physical and psychological effects. While the methadone withdrawal symptoms aren't severe, they may last a few weeks or months. The length of time you suffer from withdrawal depends on how long you took the drug and how high your dosage was. Many people who withdraw from methadone will wean themselves off the drug slowly (typically one or two milligrams a week) to combat the withdrawal symptoms. If this is not possible for you, you do have the option of taking a milder form of an opiate, buprenorphine, which has a lower degree of withdrawal symptoms. However, you can't go straight from taking a high dosage of methadone to taking buprenorphine. You have to lower your dosage to a certain number of milligram and then switch. Contact your doctor for more information about using buprenorphrine for methadone withdrawal. While experiencing methadone withdrawal, you can also take over-the-counter medications to help you with some of the symptoms such as diarrhea, runny nose and pain. You can also ask your doctor for prescriptions for relief if the over-the-counter medications don't help. Since many of the methadone withdrawal symptoms mimic other medical conditions, it's important to let your doctor know of your plans to reduce or stop taking this drug. Your doctor will do a thorough physical exam to make sure you are in good health. If you feel as though your symptoms are unbearable at any time during your withdrawal, it's best to check in with your doctor to make sure that it is normal methadone withdrawal. In addition, since suicidal thoughts, hallucinations and depression are common psychological effects of methadone withdrawal, it's important to talk to someone about how you are feeling. If you begin to feel out of control or suicidal, contact a professional immediately. Antidepressants are available that may help you safely get through this stage of withdrawal. Interesting enough, many heroin and morphine addicts use methadone to recover from those drugs because of its less intensive withdrawal symptoms. Methadone also helps people recover from these stronger opiates by disabling the feelings of euphoria they receive from their high off heroin and other similar drugs. The more information you have on methadone withdrawal the more likely you will succeed in this drug addiction recovery. People have reported that the withdrawal symptoms are one of the most difficult things they have gone through, but it is possible to get through it if you power through it. Many times, people who try to do it alone will not recover and return to their drug of choice. Support from family, friends or a support group can be the one thing that gets a drug addict through the withdrawal process. Find someone you can trust and confide in him/her that you are beginning to withdraw from methadone. You can provide information to the person so he/she knows what to expect and how to help you. If you would rather be around people who are going or have gone through the same experience as you, contact a local substance abuse treatment center to ask about support groups in your community.